This was a very comfortable house for our family. This property was very comfortable and accommodated our family quite well for Thanksgiving Dinner. Our stay was very enjoyable. The house and furnishings were extremely comfortable and clean. This was just a very comfortable, relaxing house to stay in. Trouble with a lock. Fixed immediately. Trouble with a tv, attended to immediately. Friendly people. The team was very helpful. The only non-routine interaction concerned check-in instructions. Those were sent a day early, at my request, which helped us plan the last few details of our trip. We thoroughly enjoyed our stay. The house fit our needs quite well and the location was wonderful. I had three favorite features. The first was that the property accommodated our three-generation family comfortably. The second was the location close to the beach and the business district of Manzanita. The third was the provision of nearly all the equipment and supplies we needed. We anticipated needing a few extra kitchen things for Thanksgiving dinner, which we brought. Very friendly, professional and prompt! Communication was clear and easy. Love the loft! So cozy. And the proximity to beach access is truly excellent. Thank you for a wonderful stay! I was confused about where to find the extra towels, so I sent a late message to Airbnb and got a reply first thing in the morning. I really appreciated the quick and thoughtful response! The property was lovely. I did really appreciate that Jan reached out to make sure it would be comfortable for our group; I think she was right to do so, because while it worked totally fine, I think we could have done with a slightly bigger place for 6 adults, not all of whom are couples. Anyway, this is just to say that I appreciated that you all reached out to check in! Your team was amazing! They allowed us into the house early so we could drop our things and head to the beach with the dog. That meant the world to us! Instead of worrying about the "rules" you bent a little and it made our stay even better. Thank you again! Great staff from beginning to end. Great little house on the corner and two blocks from the beach. Loved the wood burning stove and everything we could possibly need in the kitchen was there! Thanks again Everything about this house was great! Perfect location for walking to the beach. House was just the right size for us and had a great charm about it. Being able to bring my son's dog was the best. He is a city dog and had never seen the beach nor been able to just run. He was so happy! The only negative was that there weren't any brushes or sponges for cleaning the dishes before putting them into the dishwasher. If that's the worst problem, I will take it! Thank you for a great experience.. I appreciated the speed of response, clarity of the contract and kind phone interactions. Bravo. It is a beautiful house in a wonderful location. The collection of books is pretty great and the art (rather than "vacation house decor" is really nice). Danielle could not have been nicer, or easier to work with- she was exceptionally helpful when a family emergency made it necessary to change our dates on fairly short notice, and when we checked in and found a possible problem at the cottage, she came by personally to check it out and follow up. We will definitely recommend their agency and look forward to returning and working with them in the future. We very much appreciated the special discount of the 3rd night free, a big plus, and the dog friendly policy for this property. Wonderful light, very cozy, well-supplied cottage, very convenient to Laneda and all the shops, restaurants, bakery, and Marzano's :) etc. and only a short walk to the beach- Excellent location! Highly efficient and professional. Excellent communications throughout the entire process, from check in and checkout, everything in-between. Found the home to be inviting and comfortable. We loved our stay. The home was lovely and extremely comfortable. We appreciated all appliances were in working order and the entire house was so clean. The information binder was a time-saver., full of pertinent information. Well thought out touches throughout the house, and we had all we needed. It was like being "home". I was able to call in to make payments and modifications to our stay. Quick and easy! The location is great, close to the beach with plenty of wildlife. We love the open layout of the house and full kitchen. We enjoy staying here and will be back soon! They are courteous and helpful! The layout of the house is awesome! The property was wonderful! Very spacious and a great layout for two families. The house was stocked with everything (and more) we needed and very clean. The furnishing, decorations, and details were lovely. It was walking distance to the beach and in a quiet location. We will definitely be returning. 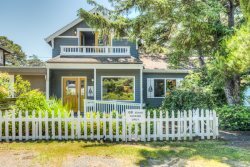 Manzanita Beach Getaway's does amazing work on their properties! The booking for the vacation was fast and easy. Everything was really clean and organized. I will definitely come back in the future. The stay in the property was very clean and organized. The patio in the back was a bonus. My favorite property feature was the ability to sit outside and watch the golfers. We arrived 45 minutes before check in and was able to access the house, the person on the phone was accommodating. House was better than described; nice furnishings, very comfortable beds, everything you could need in a kitchen, multiple areas to hang out. Main living area; loved the high vaulted ceilings, large windows everywhere, plenty of comfortable seating. Lovely time! We enjoyed all aspects of the house and were very comfortable. The weather was perfect. Thank you for a great stay. Loved the deck with the ocean view. The bedrooms were spacious and comfortable. A little hiccup over receiving the rental agreement, but that was graciously and very satisfactorily taken care of. We wished we could have stayed longer. It met our needs perfectly. Tell us about your favorite feature of the property. Proximity to town and the beach. Very convenient but still very quiet location.